Sometimes, when my brain won’t shut down, I just have to make things. I don’t always know where I’ll finish, but I do know that I enjoy the process. So it is a quarter to 4:00 a.m. and the home fires are burning bright. Things keep piling up and more ideas than time drift past. Here is a peek, not finished projects, but a couple well on their way. 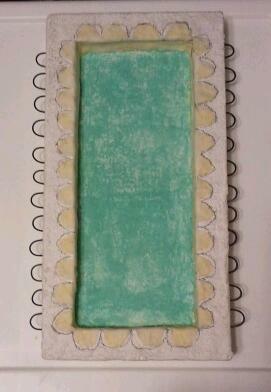 Above is a frame with a recess cut in the center, lined with scalloped muslin, and wire loops on the side. 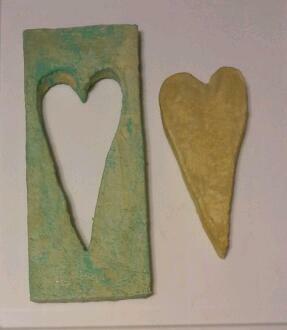 The second image is of a heart with the piece it was cut from. They will all show up again soon. When I can think what else to do. 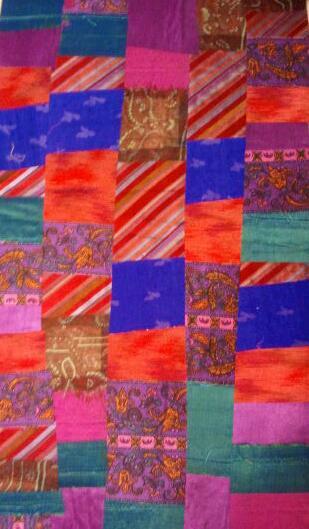 Below is the beginning of a quilt. I started this in a class taught by Sue Benner (it looks nothing like her work, which is fantastic.) It is far from finished, not even close. The colors are more representative of my work. Bright, full of pinks, purples, and oranges. Machine embroidery, beads and embellishments will further adorn this piece, currently comprised of tie silks and fancy dress fabrics. This weekend I’ll celebrate three birthdays, two grandsons and a very dear friend. It will be two crazy mixed up days and no time to sit quietly in my room and create. Look out, the sewing machine has been plugged in! First, I must give a shout out to Diana Pease, for the fabric and the desire to start sewing again. 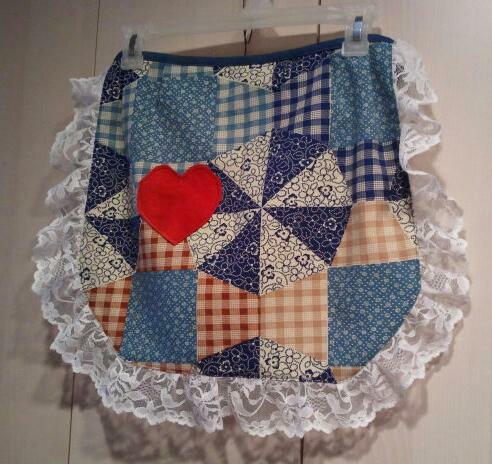 I made this cute apron with red, red heart pocket and jean waist band from a box of scraps picked up at Diana’s house yesterday. Thanks for the inspiration! I’ve been threatening to showcase some fabric creations and now that the machine is humming, watch out!